For anyone unfamiliar with the term, Anthropocene, it is an unofficial chronological-geologic term for an epoch that arose when human activities began making a significant global impact on the Earth’s ecosystems. The dates are disputed among scientists and thinkers who hold various ideological views (see The Anthropocene Debate article in Enlightenment section). Some suggest the epoch began many thousands of years ago, when humans were dispersing across the planet, including the Americas. Other posited dates include: the beginning of agriculture and the Neolithic Revolution around 12,000 years ago; the Industrial Revolution (late 18th century); and the Atomic Age, in 1945 with the atomic bombs unleashed on Japan. In all instances, the Anthropocene is meant to emphasize humanity’s wide-ranging negative impacts on all natural ecosystems. What’s it like to live in the Anthopocene? Personally speaking, my wife and I, in company with other elderly folk, have enjoyed what may be considered a privileged existence in our human-dominating era, one that has exceeded our youthful expectations—especially in terms of material comfort. Actually, we were just plain lucky to grow up in the mid-20th Century, a prosperous post-WWII era marked by a booming U.S. economy—thanks to plentiful, inexpensive fossil-based energy. Throughout those happy days, the potential for fulfilling the “American Dream” (however one defines it) was within reach—if one worked hard and lived responsibly. Gainful employment in many professions was a reasonable expectation, thanks largely to expanding, inexpensive, high-quality educational opportunities that provided essential knowledge and skills. As an example of educational expenses, the annual tuition for our liberal arts college education amounted to a mere $400-500, a fantastic bargain when compared with our alma mater’s current $35,000 annual tuition (plus-fees). It’s understandable that older generations, including our parents’ WWII generation, and ours—the so-called “Silent Generation”—are increasingly challenged to fully understand, appreciate, and cope with the enormous changes that have occurred during decades-long lifespans. In the past 100 years significant changes have occurred worldwide in every area of life, including: scientific and technological advances; economic growth; socio-cultural diversity; educational and artistic experimentation; environmental degradation; and partisan antagonism in politics and religion. Beginning with the Industrial Age, the conventional paradigm promoted throughout the developed world has been based primarily on a belief system of constant economic and material growth, infinite natural resources, and human technological prowess. It seems that this ineffective, outmoded paradigm continues influencing the thoughts and actions of many senior citizens in addressing the converging crises that have grown increasingly severe over the past three decades, with climate change posing the greatest challenge. The Boomer Generation is somewhat more attuned to these changes, and provides a moderately progressive transition from older generations to the younger Generation X (b.1965-1980) and the Millennial Generation (b.1980-2000). At present, boomers are mostly in charge of running things, with the x-generation gradually assuming major leadership roles throughout society. But it’s the youngest generation that is immersed in the contemporary experiences of socio-cultural, political, and environmental changes that will mostly impact their futures. They realize they’ll bear the brunt of mitigating, correcting, and living with the good and bad legacies of us older generations. 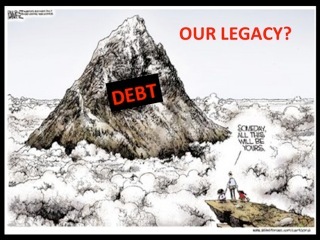 For certain, we’re leaving them a mountain of debt and environmental woes as our chief legacy. This commentary was inspired when viewing a video of a 56-minute lecture given by Dr. Nate Hagens at the University of Wisconsin-Stevens Point titled Turning 21 in the Anthropocene (An Invitation For Young People To Participate In Their Future). The event was co-sponsored by the Wisconsin Center for Environmental Education and the UW-Stevens Point Office of Sustainability to celebrate Earth Day 2015. Dr. Hagens was a highly successful broker on Wall Street prior to making a momentous life-changing decision: to live more simply and pursue more meaningful life work. He has served as lead editor of The Oil Drum, currently serves on the board of five sustainability organizations, including Post Carbon Institute, and serves as a popular presenter for prestigious sustainability-oriented conferences and events. This slideshow lecture is very much worth viewing, for people of all ages, including old foggies who can and should do whatever they can to create greater resilience and sustainability for future world citizens. > Resilience: Turning 21 in the Anthropocene (Nate Hagens). This video presentation is featured in the editor’s commentary above. > Resilience: The Anthropocene Debate: Why Is Such A Useful Concept Starting To Fall Apart? (Aaron Vansintjan). The term ‘Anthropocene’ has entered the climate change debate, and the question is whether it should stay there. It neatly encapsulates the idea that the Holocene—a scientific term referring to the present era—is no longer an adequate description. We now exist in an era when humans (anthropos) have fundamentally changed the geology of the earth and are present in almost all ecosystems. > Casse-The Daly News: Thoughts On Pope Francis’ Laudato Si (Herman Daly). Laudato Si Is Already Receiving Both Strong Support And Resistance. The resistance testifies to the radical nature Of Francis’ Renewal Of The Basic Doctrine Of The Earth and Cosmos As God’s Creation. Pope Francis will be known by the enemies this encyclical makes for him, and these enemies may well be his strength. So far, in the US they are not an impressive lot. > The Archdruid Report: The Delusion Of Control (John Michael Greer). The delusion of control—the conviction, apparently immune to correction by mere facts, that the world is a machine incapable of doing anything but the things we want it to do—pervades contemporary life in the world’s industrial societies. The inner secret of the delusion of control: those who insist on seeing the world in mechanical terms end up behaving mechanically themselves. > Post Carbon Institute: Sustainability Metrics, Growth Limits, And Philanthropy (Richard Heinberg). It is increasingly apparent to many who study sustainability metrics that industrial civilization, as currently configured, is unsustainable. Two important metrics have fallen out of fashion: human population growth; and GDP growth, of which population growth is a major component. > Transition Voice: How Pope Francis’s Climate Encyclical Is Liberating The World (Lindsey Curran). In my life there are two things that have the effect of at least somewhat isolating me from others. The first is being a writer on climate change, peak oil, and the economic crises bound up with those modern predicaments. The other is being a Christian environmentalist. > Resilience: Reaction To Pope’s Green Encyclical – June 27 (Bart Anderson). (Roundup) Go and pollute no more! Hispanics hear Pope’s message. Rethinking what it is to be human. Encyclical may be slow to take hold. See also: End Times For Climate Denial. This roundup of news indicates the shift in public awareness about the reality of climate change and the need for constructive action. > Winona Daily News: Farmers Find Healthy Soil Works For Crops, Bottom Line (Dan Gunderson). Research shows healthy soil can reduce erosion, slow runoff into rivers, and cut the need for fertilizer. Despite such benefits, it remains hard to convince farmers to leave behind traditional tillage. No-till practices are used on less than .05 percent of Minnesota farm fields, according to the US department of agriculture’s 2012 census; reduced tillage happens only about 30 percent of fields. > Weathering The Storm: Worldwide Water Woes (Michael Conley). Water woes haven’t been the life or death threat for us as it has others. But make no mistake; its growing ripple effect will directly and indirectly affect our food and water supply, health, pocketbooks, national security and way of life. The water problems in California and the southwest could be harbingers of our future. It’s a good time to start thinking more about our water footprint and what we can do to reduce it. See also: NASA Satellites Show World’s Thirst For Groundwater. > Ensia: As Arctic Sea Ice Shrinks, So Does Our Window Of Opportunity (Jenny E. Ross). Dwindling arctic sea ice is a portentous warning that we are confronted by a rapidly developing planetary crisis. The longer we wait to address the underlying human causes of climate change, the worse the problem and resulting impacts will be. Our narrow window of opportunity to avert unimaginable harm is rapidly shrinking along with the arctic sea ice. > Common Dreams: The Lancet: Fossil Fuels Are Killing Us… Quitting Them Can Save Us (Jon Queally). The peer-reviewed report—titled Health And Climate Change: Policy Responses To Protect Public Health—declares that the negative impacts of human-caused global warming have put at risk some of the world’s most impressive health gains over the last half century. Doctors say that quitting would be the best thing humanity can do for its long-term health. > Ensia: If We Quit Oil, Then What? (Marian Swain). With electricity demand fairly flat in the US, it is hard to encourage innovation in clean technologies: increased demand due to a large-scale shift to electrified transportation, however, would make the US market more like that of china or India, where huge unmet electricity demand creates markets more likely to encourage clean energy innovation. > Crude Oil Peak: Asia’s Oil Consumption At Record High While Production Peaked In 2010 (Matt Mushalik). The question no one asks (or wants to ask) is how much oil there is to carry Asia through the decades to come. No one can give an answer of course but it is clear that if past oil consumption and production trends continue the region will slide into a huge oil crisis. > Our Finite World: BP Data Suggests We Are Reaching Peak Energy Demand (Gail Tverberg). Right now we seem to be reaching peak energy demand through low commodity prices. (see historical energy data in BP statistical review of world energy 2015). Lower commodity prices over the past four years (with a recent sharper drop for oil) likely reflect an affordability problem due to falling wages, when energy prices rose, along with commodities in general, in the early 2000s. > Common Dreams: Anger Aimed At Troika’s Ruthless Neoliberalism As Greece Exit Looms (Jon Queally). Global financial markets are responding to Sunday’s announcement that Greek banks and the nation’s stock exchange would be closed this week and the ordered imposition of capital controls. The Greek financial crisis is at a feverish level, and citizens are being asked to vote “yes” or “no” against a deal put forth by the European Commission, the International Monetary Fund, and the European Central Bank— in exchange for the continuation of cash infusions and extended credit. > Peak Prosperity: The Global Credit Market Is Now A Lit Powderkeg (Brian Pretti). The probabilities are very high the US Federal Reserve will raise interest rates this year, which indicates a broad re-pricing of credit in the US financial system and economy. Executive summary: a bond market bloodbath will occur as rates rise; municipal, corporate and sovereign defaults will soon follow; liquidity will suffer as necessary goods prices rise, but securities’ prices will fall; and the new, nuclear risk of a derivatives market could collapse. > Mail Tribune: Americans Households Have The Highest Credit Card Debt Since Recession (Omar Etman). On average, American households are $7,177 in debt, according to a CardHub study. That’s the largest it has been in six years, and is indicative of a national spending problem. Now’s a good time to start decreasing debt. > Market Watch: 70 Million Americans Teetering On Edge Of Financial Ruin (Catey Hill). According to a survey of 1,000 adults released by Bankrate.com on Tuesday, nearly one in three (29%) American adults (that’s roughly 70 million) have no emergency savings at all — the highest percentage since Bankrate began doing this survey five years ago. > Reuters: Look After Fossil Fuel Workers In Shift To Clean Energy: Union Chief (Megan Rowling). Coal, oil and gas workers need a secure future as the world moves away from fossil fuel use, and governments and companies must plan to ensure any new global climate change deal is fair for all those impacted, a top trade unionist said. > Live Science: Fight Childhood Obesity In The Home, New Guidelines Say (Carl Nierenberg). Parents and pediatricians should fight childhood obesity by improving diet and activity levels in the home, according to The American Academy of Pediatrics (AAP), which is updating its guidelines about ways to stem rising rates of childhood obesity. The updated recommendations encourage parents to help change kids’ eating and levels of activity at home, and emphasize family-based strategies to promote healthier lifestyles. > New York Magazine: Marriage Equality And The Modern Social Revolution (Jonathan Chait). A great deal has happened in a very short time: America’s first elected black president (possibility of electing the first female one); two women appointed to the Supreme Court; the ban on openly gay military service; the groundswell of support for marriage equality and transgender rights, and renewed feminist reforms in the home and workplace; the attention to eliminating bullying in schools. In sum, social autonomy has sprung forward on almost every front. > The Contrary Farmer: Farming Starts In Cities (Gene Logsdon). Food farming, as opposed, say, to fuel farming (ethanol), is coming on line as a way to deliver higher quality and fresher food to people willing to pay what the new food is worth—and with backyard food mini-farms for those who want to save money or guarantee quality by producing their own. > On the Commons: National Walking Summit Make Strides Toward Healthier Future For All (Jay Walljasper). Beyond better health, walking has been proven to improve lives in other important ways by strengthening social connections, revitalizing our communities, lowering health care costs improving kids’ school performance and cutting household expenses. > Project For Public Spaces: Great Communities Grow At The Intersection Of Health And Design (Jay Walljasper). Medical leaders have also shown that placemaking can play a huge role in promoting better health for all Americans. According to a delegation of public health experts meeting with Minnesota citizens during the 4th annual placemaking residency, little exercise and poor diets pose a serious problem not only on foreign battlefields, but also here at home for people of all ages. > New Economics Forum: We’re Winning: Tapping The Legal System For Climate Change Action (Sandra Bernick). Fossil fuels are in some ways a lot like tobacco –industry lobbyists continue to present them as cheap and socially acceptable. The fast-growing divestment campaign has done lots to pressure large companies and other investors into being more socially responsible, but claims that fossil fuels are not only cheap but good for our societies are still widespread.